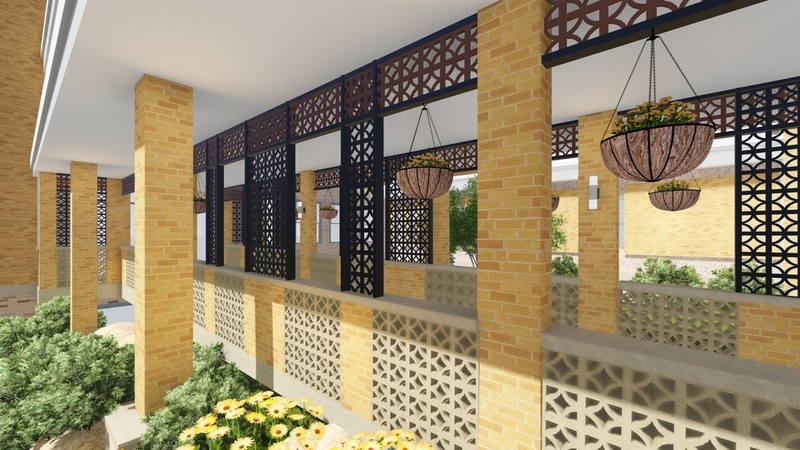 qkArchitecture was commissioned to design upgrades and improvements to the dated and institutional entry, terraces, and dining rooms that have been in place since the the early '60s at the Holy Family Manor. 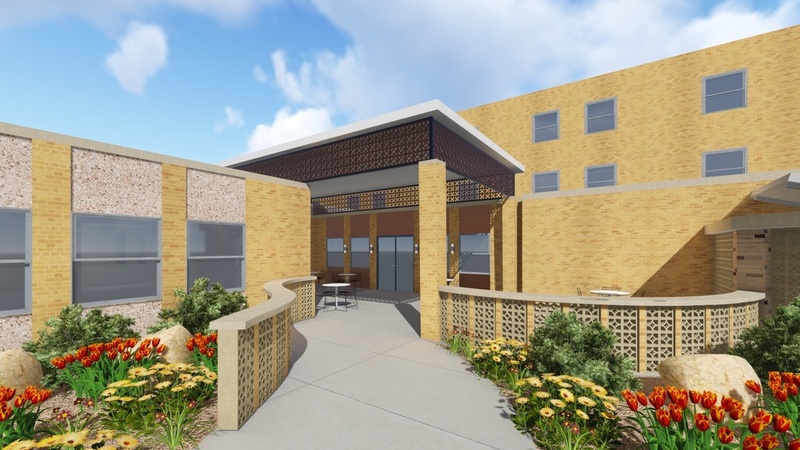 The Community at Holy Family Manor desired to soften the institutional feel of the current entrance ramp and to expand the current dining room by adding additional interior and exterior seating with a partially covered patio. Embracing the original style of the building, we borrowed from existing architectural elements, including the decorative concrete blocks, curvilinear screen walls, and repetitive vertical panels, and developed a design concept that complemented the original building while introducing new points of interest. Inspired by the patterns created by the block walls, we incorporated a decorative screen to bring down the scale of the formerly imposing and industrial entry and created a dynamic procession to the main entrance with the changing shadow patterns throughout the day. To meet the Manor's goals of having an outside dining area and to bring daylight into the newly covered dining patio, we employed the same decorative screening as a clerestory for the new high roof over the patio. Low garden walls that follow the same curves as the nearby breezeblock walls define the path to this upgraded patio. Inspired by the old and bringing in touches of the modern day, we hope our work stands in harmony with the original design and looks as if it could have always been.